So you say you've been pursuing your interest in wine for some time now, and you're beginning to build up quite a store of empty bottles from very special wine experiences. You really hate to throw away these sole remaining mementos of glorious wines gone by, but what to do with all of those empty bottles? Answer: arts and crafts, baby! With nothing more than a really good drill (made for drilling glass--don't use a regular bit for this! ), you can make lovely and functional items for your home. One easy project is the wine bottle incense burner. This tutorial tells you how to use such a burner, not make one, but you get the idea. You can buy the split ring and bits of chain on Ebay, then you just need to drill a few holes for air flow. Sure, you can buy a fancy one...but wouldn't a Chateau LaTour burner filled with wine-scented incense be even better? In a similar vein is the wine-bottle lamp. You can purchase kits online or in craft stores. Use your imagination--at last, a perfectly good use for those gigantic-format 7-liter bottles if you have one! For a more low-tech, but less practical approach, they sell kits that let you easily transform a bottle into an oil lamp. If you actually use oil lamps even when the power is working, then this may be the project for you! Or you could just build a house out of them. How about some info on what to do with all the corks? This is a great way to build a wall of your home. 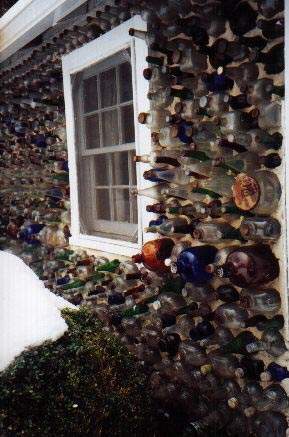 Just make a few trips to the glass recycle dump and bring home the materials needed for a very cool wall! How can I cut the bottom off a wine bottle? There is a wine bottle cutter out there - I'd search on ebay. They're pretty cheap and were popular in the 70s. As for corks, one thing you can do with corks is glue them onto a board and make a bulletin board. You can also purchase serving trays that have recesses that you can glue corks into and have that be the bottom of the serving tray.